Frank Gasperik passed away Thursday, the 3rd of May at approximately 9:13 PM. He could be maddening sometimes. When he worked for me, he would play Rogue even though there was plenty to get done. The last straw was when Roberta found him asleep in front of the screen -- which was showing Rogue. He was also enormously loyal, and inspired several memorable characters. Those who read Lucifer's Hammer, Footfall, and Fallen Angels will know the kind of person Frank wanted to be and sometimes was. Many years ago when I rode motorcycles we rode up to Northern California along the Pacific Coast Highway. I didn't know much about the machines, but Frank kept both of them running -- and managed to sing for our supper. He had brought his guitar. I was willing to pay for drinks in order to get people's stories, but Frank saw to it that we never had a bar bill. It made for a memorable trip and I collected a number of characters. So Hairy Redd is gone. We'll miss him. Farewell, old friend. Fire and fleet and candle light and Christ receive thy soul. He touched many people's lives, and will be greatly missed. This page is here to collect his writings and other materials. 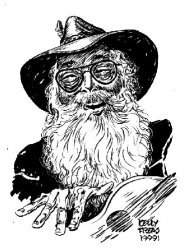 If you have anything thing he wrote, any pictures, recordings of his filk performances, or anything else you would like to donate, please email the webmasters. Video and audio recordings of Frank's Filking! A letter detailing funeral arrangements, with a picture of the design of his reliquary, by William R. Warren, Jr.
Never Kick The Tires, an article about how to select a "quality" used car. No Rayguns No Rocket Ships an essay about discovering Science Fiction.